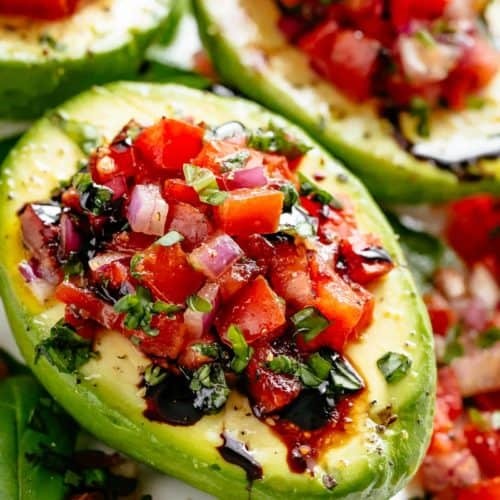 Bruschetta Stuffed Avocados drizzled with balsamic glaze makes an incredible light lunch or snack! Take creamy avocados to a different level with this Bruschetta Stuffed Avocados recipe. 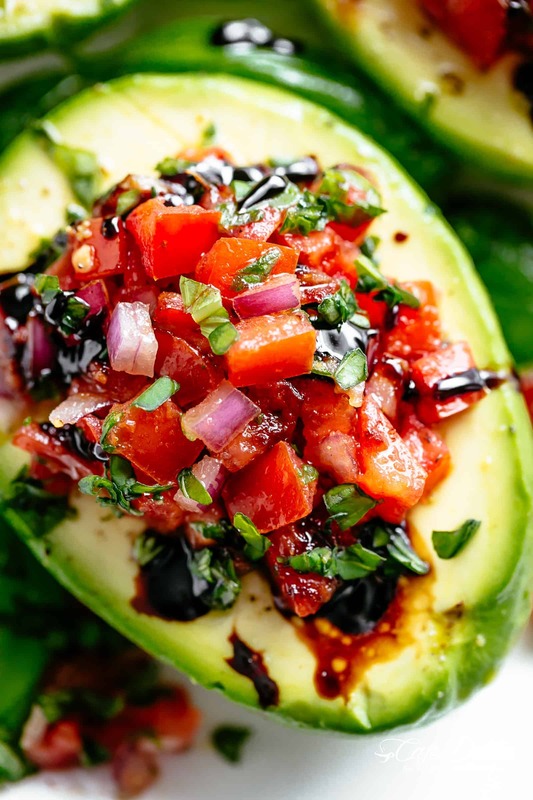 Juicy ripe tomatoes with basil and onion are tossed in olive oil and a touch of garlic, then stuffed into Avocados. Topped with shaved parmesan and drizzled with a balsamic glaze for an incredible flavour combination! You have all loved our Caprese stuffed avocados and have been asking us for another alternative recipe. You’ll be so glad for this one! Fresh, ripe tomatoes with basil and red onion are the perfect match…especially when combined with a touch of olive oil and a kick of garlic! Stuffing creamy avocados with a Bruschetta mixture though is pure heaven. Especially for those of us trying to watch our carb intake! Bruschetta Stuffed Avocados is similar to this Italian Herb Bruschetta Chicken and this Grilled Bruschetta Portobello Mushrooms recipe, but with the ultimate avocado twist. Serve on fresh basil leaves and you have Spring/Summer on a plate! Drizzle it all with a homemade or store bought balsamic glaze for the best light meal! Or keep it low carb and leave the drizzle to the side. 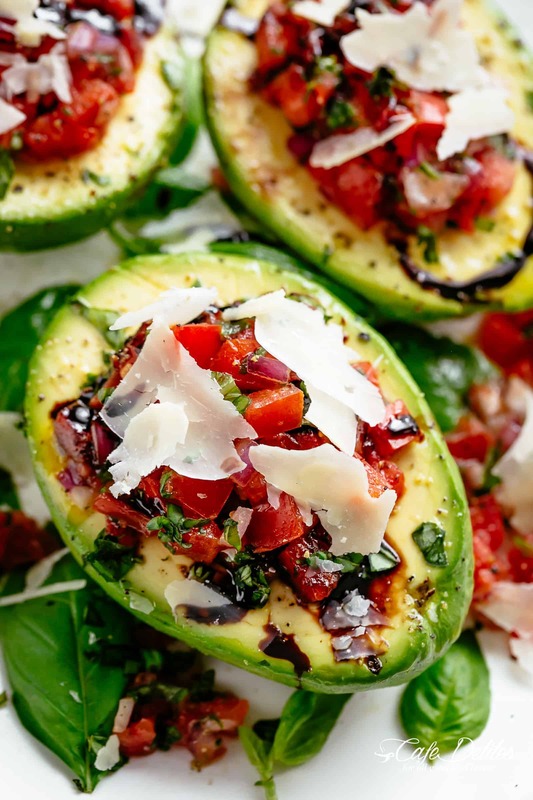 Easy to make, easy to eat and AMAZING Bruschetta Stuffed Avocados! Top with shaved parmesan for even better flavour! Looking for similar recipes, try these! BRUSCHETTA STUFFED AVOCADOS ON VIDEO! Juicy ripe tomatoes with basil and onion are tossed in olive oil and a touch of garlic, then stuffed into Avocados for an incredible light lunch, dinner or snack! Topped with shaved parmesan and drizzled with a balsamic glaze for an incredible flavour combination! Combine tomatoes, onion, garlic, olive oil, salt and pepper in a bowl. Toss well to evenly combine all of the flavours. Arrange prepared avocado halves onto a plate with fresh basil leaves. 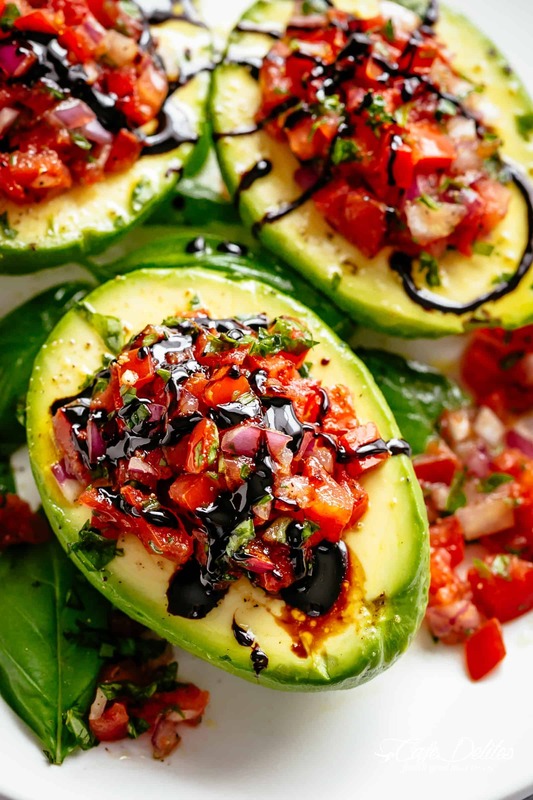 Spoon the Bruschetta filling into each avocado halve and drizzle with balsamic glaze. Top with chopped fresh basil and parmesan cheese. Serve immediately. I would never have thought of that, but it’s a great idea. Drooling here and would love to tuck into one of those now!